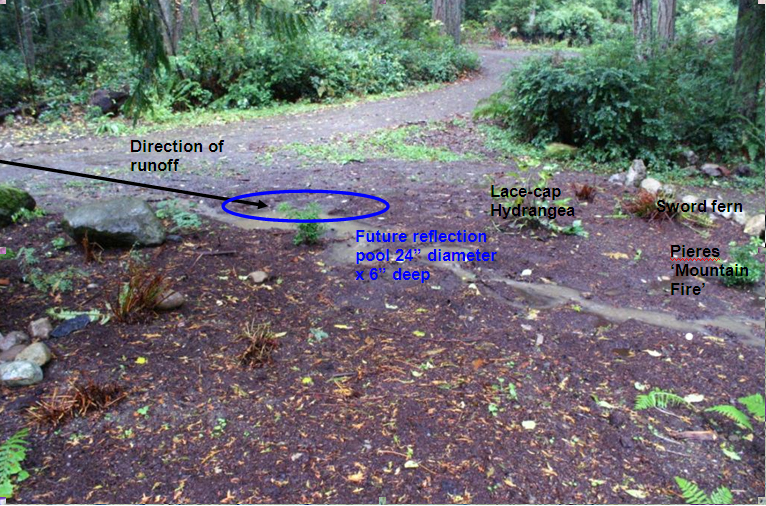 Once again, it is saturation time in Western Washington, when the ground has absorbed all that it can and every rainfall runs off into some other place. 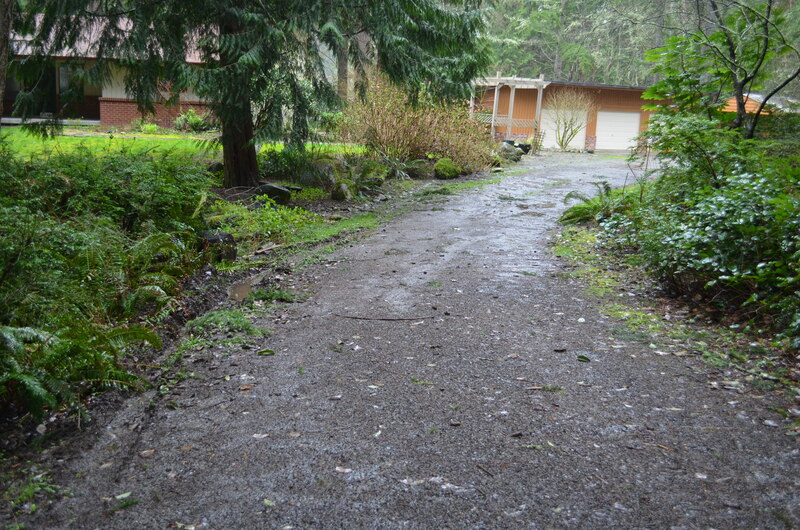 Despite my best intentions, the work that I did on the front yard wasn’t quite enough to counter the massive amount of water that collects on the driveway and runs off beside the house. I am increasingly convinced that the addition of two additional driveway extensions has contributed to the basement flooding that never existing when I was growing up there. 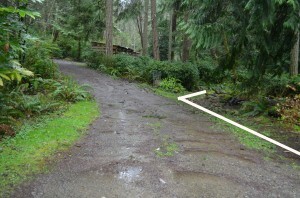 This stretch of driveway was wooded during the 70’s and 80’s. 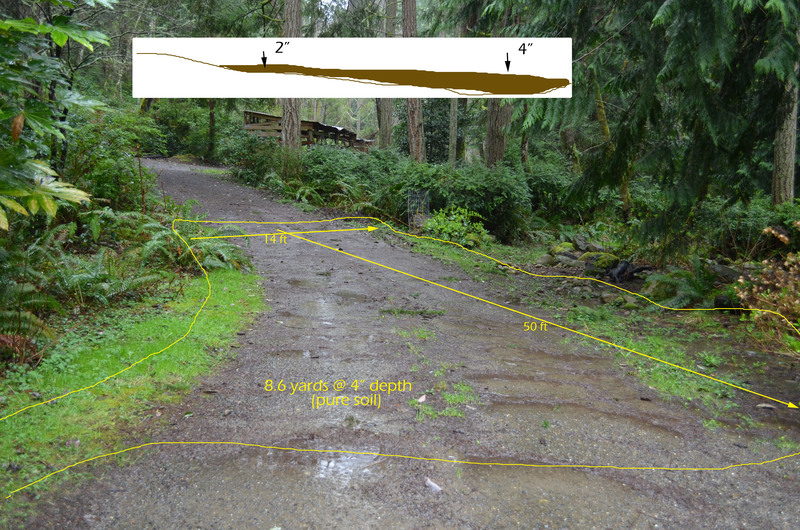 Native vegetation, including salal, huckleberry, and sword fern, was sufficient to capture runoff coming down the steeper slope from to the right. Now, this is the lowest point of the driveway by the house and collects rainfall as well as runoff that converges at a point by the cedar tree and pours over a rock wall and down to the lower portion of the house foundation. 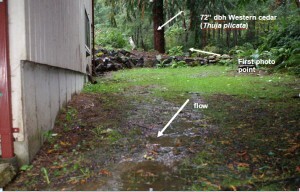 Water in the basement flows in a direction consistent with this theory. At first, I considered simply decommissioning this section of driveway by bringing in topsoil, logs and rock to recreate a forest. There were issues however of temporary and longterm erosion, and how to landscape the area so that it would fit into the rest of the garden. Research into drain systems showed another solution: a trench drain. Except my version would follow the edge of the driveway rather than crossing it. Therefore, a plastic gutter would be sufficient to carry the runoff. I plan to implement this as soon as I can get my other projects a bit further along. On the topic of experiments with drainage is a reroute of driveway drainage into the lake. 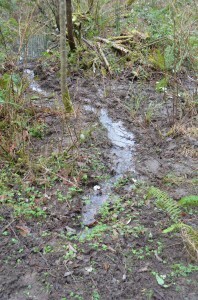 This ditch once carried water from the driveway ditchline and a neighbor’s wetland out to the county road ditchline. A few hours of slinging mud and I was able to dig out a trench to reroute the flow – at times in excess of 5 cfs – into the lake. My ultimate goal is to correct drainage issues such as this to keep the lake as full as possible throughout the year. 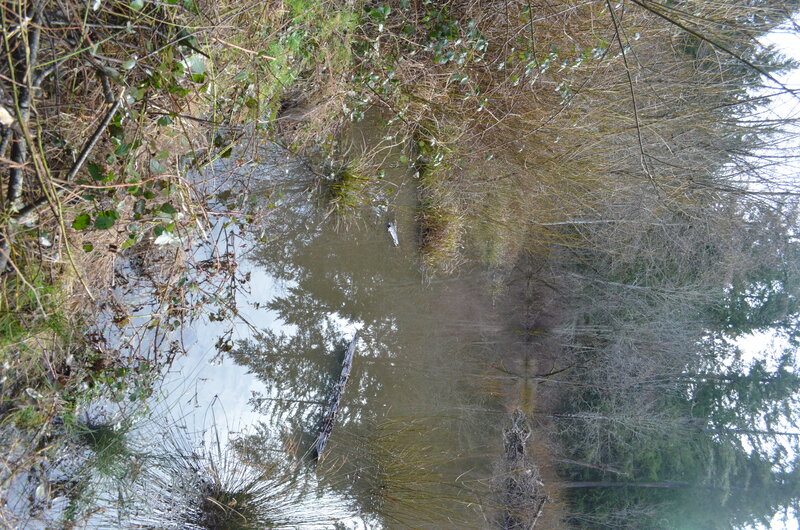 The above photo was taken at the lower end of this 5 acre open water wetland. The dam that maintains it is in the foreground. 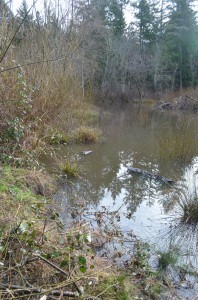 Most of the water that flows over the property reaches this basin.